DÜSSELDORF, October 16, 2013: Registration for NPE2015 is now “live” at www.npe.org, enabling plastics professionals worldwide to sign on for the industry’s largest trade show and conference, it was announced by SPI: The Plastics Industry Trade Association, which produces the triennial NPE. During K 2013, those who register for NPE2015 at the NPE stand in the U.S. Pavilion (Hall 13, Stand B91-28) will receive a complimentary pass to the NPE2015 show floor and be given priority in making hotel reservations several weeks before housing opens to the general public in June 2014. In addition, anyone who registers before midnight on December 31, 2013 will also gain early access to the NPE housing reservation system.NPE2015 will take place March 23-27, 2015 at the Orange County Convention Center in Orlando, Florida, U.S.A.
By clicking on the REGISTRATION button at www.npe.org, attendees can get in early and ensure they have early access to the NPE2015 hotel block . For international visitors who require a visa to enter the U.S., registration includes the option of requesting an official invitation letter from SPI, which must be presented for visa interviews at U.S. embassies and consulates. NPE2015 will attract more than 60,000 attendees from over 20,000 companies in 100 countries and will include 2,000 exhibitors of machinery, materials, tooling, software, services, and custom processing capabilities. About 40% of the exhibitors will come from outside the U.S., while the U.S.-based companies will constitute the largest number of American suppliers of plastics technologies to exhibit anywhere. There will be processing systems in full-scale operation throughout the show. ● ANTEC® 2015. Featured at NPE2015, this annual event produced by the Society of Plastics Engineers (SPE) will consist of hundreds of original, peer-reviewed technical presentations. ● NPE3D™, a new annual event created by SPI, will be held for the first time during NPE2015 and be open to all attendees, providing them with opportunities to learn about 3D printing through exhibits and actual demonstrations. ● SPI’s ‘Business of Plastics’ Conference. Presenters will focus on the business implications of such topics as technology innovations, sustainability issues, reshoring, expanding markets, and management challenges such as human capital development—all relating to markets such as aerospace, automotive, building and construction, electronics, medical, and packaging. ● The International Plastics Design Center. The Design Center will showcase innovative applications by designers, engineers, and processors serving appliance, automotive, electronics, medical, packaging, and other consumer and industrial markets. ● Other special programs and events, such as the SPI President’s Luncheon, the Plastics Hall of Fame induction ceremony and banquet, and multi-exhibitor pavilions focusing on specialized technologies or industry sectors. 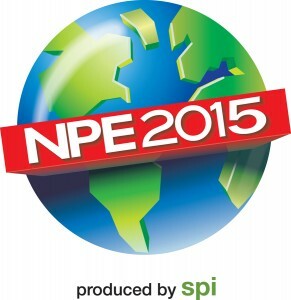 Another of SPI’s innovations for NPE2015 is to provide the brand-owner buying teams attending the show with complimentary on-site meeting spaces, or “Mission Control Centers.” Some of the companies taking advantage of this new program are Apple, Bayer/Medtronic, BD/Becton Dickinson, Berry Plastics, Bemis, Chrysler, Covidien, Ford, John Deere, Kimberly Clark, Mars, Newell Rubbermaid, Phillips Respironics, Tervis Tumblers, and Toro.